Having been separated from Flash Thompson by the F.B.I. (long story, do the internets and Googles thing) and finding itself back in the city that never sleeps, the Venom symbiote needs one thing to be whole again: a host. The longer it goes without one the more desperate it becomes until fate, seemingly smiling on it, “introduces” it to Lee Price during a “showdown” between Tombstone and the Black Cat’s goons. Realising that Price is an ex-Ranger and former soldier, the symbiote immediately bonds with him as it longs to once again to live the same sort of heroic life as it did with Flash, but it soon discovers that not all former military operatives are on the side of the angels. See, Lee Price was hired by Mac Gargan to look tough and be extra muscle in case things went bad at the meeting, which they inevitably did, and when presented with the opportunities that control of the symbiote offers him, Price decides that he’s going to use his new found power to increase the standing, regardless of who gets in his way or what he has to do, of one person and one person alone. Himself. A struggle between the symbiote trying to do the right thing and its new host who wants to do the exact opposite begins, which throws Venom into conflict with organised crime, the Scorpion and Spider-Man and ends the same way as it always does for the extra-terrestrial entity. That is, not well. 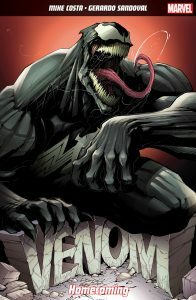 But fear not symbiote-fans, because no-one’s about to thrown the newly heroic Venom under the bus and before you can say, “Sheesh, we haven’t seen that guy in a while”, the former Guardian of the Galaxy’s (well, half of one at least) salvation arrives in a most unexpected, and incredibly welcome, form.